Beebe Healthcare is proud to recognize George Banks of Beebe Physical Rehabilitation as the January Living Our Values Every Day (L.O.V.E.) award recipient. Last year, a task force of Beebe Healthcare team members met over multiple months to examine exceptional patient experiences and create a system of values, followed by every team member when performing at his or her best. George Banks transports patients to Beebe’s Physical Rehabilitation locations. He was recognized for adhering to the Beebe Values of: Doing what it takes to keep everyone safe, treating each individual with respect and dignity; and acting with passion and love for others to make a difference. 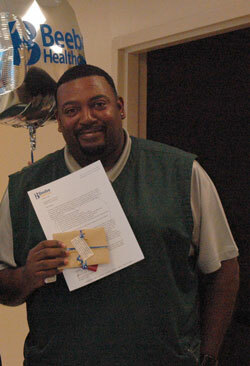 For his hard work and dedication to the Beebe values, George was recognized with the January L.O.V.E. Letter Award!